This park used to be a really good deal and we stayed often but they keep raising their rates so now they are just an o.k. place to stop and stay. If you are just stopping to eat at the buffet and maybe sleep, the dry parking works fine. We camped at RV Park at Rolling Hills Casino in a Fifth Wheel. The buffet is great and other restaurant available too. Other services are in town a few miles away. If there are events going on locally you might want to make reservations. They tend to fill up when there is something going on. We just stopped for the night. The man in the cart was friendly, office staff not so much. Quite aways south of Kingman so stop before going all the way into town. Sites are loosely designated but the primitiveness of the place is kind of nice. 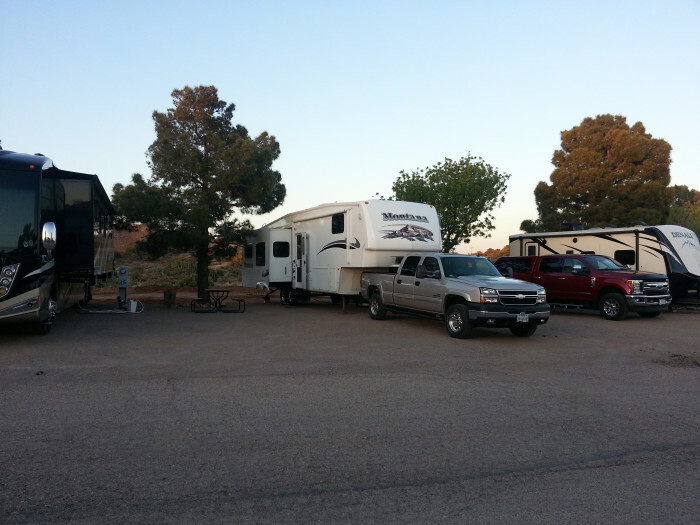 We camped at Blake Ranch RV Park & Horse Motel in a Fifth Wheel. Way east of Kingman so stop before going all the way into town. Nothing really close other than gas station/marts. This park is quite old and has a lot of long-term residents but the staff more than make up for any shortcomings. They are wonderful. Very helpful and welcoming. The weather turned unusually cold so we didn't go to the race track as much as we would have. Everything you could need just down the freeway. The car wash out front is a nice touch when you come off the road. We camped at Destiny Dallas RV Resort in a Fifth Wheel. Any thing you could need is available just down the freeway. Nice area. We loved the Gainsville annual Medal of Honor celebration that we stumbled across. As Vets we were thrilled. What a wonderful gesture this is for our heroes. We visited the Bush library and museum and loved it. This is a newer park so no shade yet. Facilities very clean and modern. Store was small but nice. Staff very friendly. Terribly windy here both visits (stopped to and from Nascar in Texas), so had to stay two nights both times when we had only planned one night. We camped at Oasis RV Resort in a Fifth Wheel. There were some good buffets and other eating spots not too far down the freeway. We visited the new Gander Outdoor store and got some good buys. Texas Roadhouse was busy but great food, as always. Nice roads and easy parking. Great gift shop. Folks all very nice and we enjoyed it enough that we stopped again on our way back from Texas. Would definitely stop here again when in the area. We camped at USA RV Park in a Fifth Wheel. Great overnight spot. The park looked well cared for (what we saw of it) and the folks in the store (handled the rental) were nice. We camped at Fallon RV Park in a Fifth Wheel. Just stopped long enough to sleep and clean up but all was fine. This is a very nice resort but a bit over-priced. We were here 8 nights and it was $425. With discounts. They also tout an RV Wash service but they will only show up if the job is big enough for them, even if they have said they would do the job requested. The staff at the desk and convenience store were very professional and friendly. The pool is not monitored and children use the 'adults only' pool at will. The pools are very nice though. There is very adequate security and the gate staff were all very friendly. Our site should have been blown off at some point (tree leaves/blooms everywhere), and the picnic table had bird droppings all over it. The pads are nice and level but sites are pretty close. Tow vehicle parking is adequate. 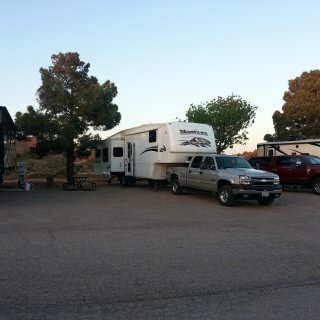 We camped at Oasis Las Vegas RV Resort in a Fifth Wheel. This is in South L.V. so a few minutes from the stip. There are all of the necessary services and stores nearby. The animal hospital a few blocks away was wonderful. This is the cleanest, most well kept RV resort we have even had the pleasure of staying in. This is our second time here. The management do not allow nonsense or inappropriate behavior which is just the way we like it. The managers and workers are very professional and friendly. We will return here ever chance we get. We camped at Sparks Marina RV Park in a Fifth Wheel.